Labor MK and Opposition Head Yitzhak Herzog attacks nationalist camp, claims Palestinian state is 'true Zionism' at INSS conference. "It is more dangerous for Israel to hold onto land and continue to be in a political stalemate than to [give away land] and separate from the Palestinians," insisted Labor head and Leader of the Opposition Yitzhak Herzog. "We are steadily approaching the point of no return beyond which separation will no longer be realistic." "This situation will lead us through a long and difficult process, at the end of which we will have a binational state," he continued. "Over two million Palestinians live in the territories of the West Bank [Judea and Samaria - ed.]. They will not just leave and go away." "If we continue like this there will no longer remain any Israeli citizens," he claimed. "The state of Israel cannot survive economically, socially, or politically like this. We are not having a theoretical discussion; this is a reality that could be the inevitable future of the state of Israel." "Therefore, we are approaching the moment of truth in our national politics," he predicted. Herzog also took the opportunity to slam the nationalist camp. 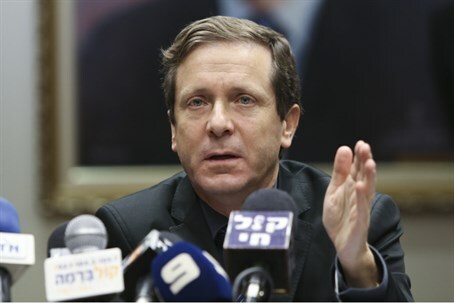 "Over the last two days, there were many speakers from the right of the political spectrum, including Defense Minister Moshe Ya'alon, Minister of Economy Naftali Bennett and others," Herzog stated. "I heard and read many things. The only conclusion that comes up time and again is that the right has no vision - and no idea where Israel will be in ten years." "What did Naftali Bennett say to us - that Jewish mercy will solve all our problems?!" Herzog fired. "What else does Bennett have to offer us but incitement! Economic Minister Naftali Bennett's vision for the future is bi-national! Bennett, you and your cohorts have turned into the founding fathers of a bi-national state, whose land is registered in your names." Herzog then took the entire concept of Zionism and twisted it in his attack. "You may not want it, but you're undermining the Jewish people, you are the true post-Zionists, you are the true threat to 2000 years of longing for a Jewish state." Herzog also brushed aside security concerns over the possible withdrawal from the strategically-crucial Judea and Samaria region. "We know how to deal with each security scenario that could arise, and thus any future agreement will require security arrangements that would leave Israel has the ability to protect its borders and its citizens itself," Herzog continued. "Reality has proven that when we are seen as lovers of order, we have the legitimacy to act firmly against our enemies and to exercise the right of our self-defense. See the support we received during Operation Defensive Shield after we conducted negotiations at Camp David in 2000, and during Operation Cast Lead when we were negotiating a true peace in late 2008 early 2009. Nobody has ransomed our right to defend ourselves," Herzog insisted. Herzog said that Israel's security is a supreme value, "unquestionably and keeping it not limited to foreign security, but also homeland security." Ignoring statistics published just days ago, Herzog continued, "Palestinian terrorism in Judea and Samaria is under control. But on the other hand, domestic violence in the form of price tag is on the rise and does not receive an adequate response, not by law enforcement and not from the government." "We as a society tend to accept Jewish violence with relative patience, perhaps because until now there were no casualties," he spewed. He called on the Defense Minister to send the Central Command head, Major General Nitzan Alon on a mission to tell the public "the real truth" about Judea and Samaria. "Tell them honestly if the threats to the Palestinians are being taken care of. And it's not that law enforcement officials do not want to help the Palestinians, they cannot; their hands are tied," Herzog continued. "One day, God forbid, an IDF soldier or police offer will pay with his life from the ravages of a price tag attack, and then Israel will begin to ask difficult questions," Herzog declared. "In 1995 we downplayed Jewish terrorism and spawned the murder of the Prime Minister [Yitzhak Rabin] and therefore we cannot let terrorism from within lift its head." "Naftali Bennett's words last night unwittingly gave a kind of tailwind aura of resistance to the violence and I am very worried," Herzog fired. "This should concern all of us." Herzog's attacks against nationalists spun further, as he insisted that expanding Jewish communities have been harming Israel socioeconomically. "At this conference we talk a lot about the strength of the State of Israel," he began. "But it's impossible to talk about political strength without mentioning Israel's socioeconomic challenges. Please note the hundred million expended in recent months by the Minister Bennett and Minister Uri Ariel to expand settlements - with Finance Minister Lapid's approval, by the way - which have been spent instead of lowering the housing prices nationwide and building the Negev and the Galilee. The rising prices of real estate, economic disparities, poverty and the erosion of the middle class threaten the cohesion of the state of Israel." "We are in a new era," Herzog stated. "Three years have passed since the outbreak of the Arab spring and the implications for the future remain unclear. Years ago, the prophets of doom were saying that radical Islam would take over during the spring. This did not necessarily happen," Herzog declared. "What is clear right now is that the power is moving more and more into the hands of the people." "It is possible that we will see this trend in all countries in the Middle East," Herzog continued. "People do not want war [. . .] I saw a survey yesterday showing that the Palestinians themselves are not interested in an intifada. Even Iran understands today that integrated foreign policy over the heads of its citizens. The 'charm offensive' is shining proof that the Ayatollah's regime is concerned about the will of the Iranian public." "As you've heard over the last two days, Israel finds itself today having common interests with large parts of the Middle East: Saudi Arabia, Kuwait, Egypt, the Gulf states and even Lebanon," according to Herzog. "[We don't know] whether it's from fear of Al Qaeda, or whether from fear of the nuclearization of Iran. In any case, the traditional sides of this conflict are not as clear as they were before." "Countries like Iraq and Libya are out of the running; Syria is weak and conflicted. The major terrorist groups - Hezbollah and Hamas - are now in deep political isolation. Hamas finds itself embroiled in the Egyptian conflict and Hezbollah is deeply immersed in the Syrian Civil War. The situation is fluid and its tectonic plates can shift at any moment, but you can't talk anymore about the stagnation of diplomatic relations with Arab countries," he added. "All these are an active sign of the Arab initiative for peace," Herzog insisted. Israel must take advantage of common interests to create a network of diplomatic relations in the Middle East. [Until now,] Israel has maintained a bilateral relationship with the Palestinians for two decades. We have brought ourselves to a zero-sum game in which both sides feel that to concede is to surrender to the other side. This is no longer the case," he insisted. "A respectable farewell is in the interests of both sides. We also have the chance for economic and political prosperity. The benefit both sides can garner from an agreement is enormous." "In the wake of the Oslo Accords, when we created peace with Jordan so that we can enjoy unprecedented prosperity," Herzog claimed. "I repeat - separation from the Palestinians, and preventing the reality of a bi-national state is Israel's paramount interest. We will have to go the extra mile to achieve this goal to maintain control of our security." "The goal of separation from our neighbors the Palestinians is so strategically vital that if the talks do not advance, we'll consider taking drastic action," Herzog stated. "It is not the way I'd prefer to approach this but it is impossible to ignore the decisions that have been made so far." "We are in negotiations as we speak, so I will not deal here with the specifics of mapmaking and military guards," he said. "It is clear that we must keep the security arrangements in our hands, and take into account every possible scenario. John Kerry, US Secretary of State, said in one of our meetings that any soldier except an IDF soldier would not be willing to die to protect the security of Israeli citizens. We must have our security but we must also find creative solutions to keep our 'red lines' intact," he said. Herzog slammed Prime Minister Binyamin Netanyahu's handling of the process. "I ask the Prime Minister, can you handle it? I'm not sure.I doubt whether you have the courage," Herzog concluded.